Superberries. The all-rounder for your health. 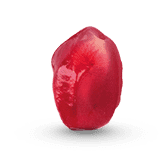 Our exclusive superberry selection will leave you ready to face any challenge. Health, power and energy. Superberries provide you with important nutrients, help you forget everyday stress and give you more power when exercising. All information given per 100 g.
It couldn't be easier to upgrade. It is best to do it every morning. 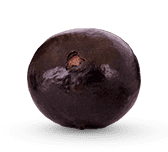 The best parts of the superberry. The superfood from your own garden. The lemon of the Baltic Sea. 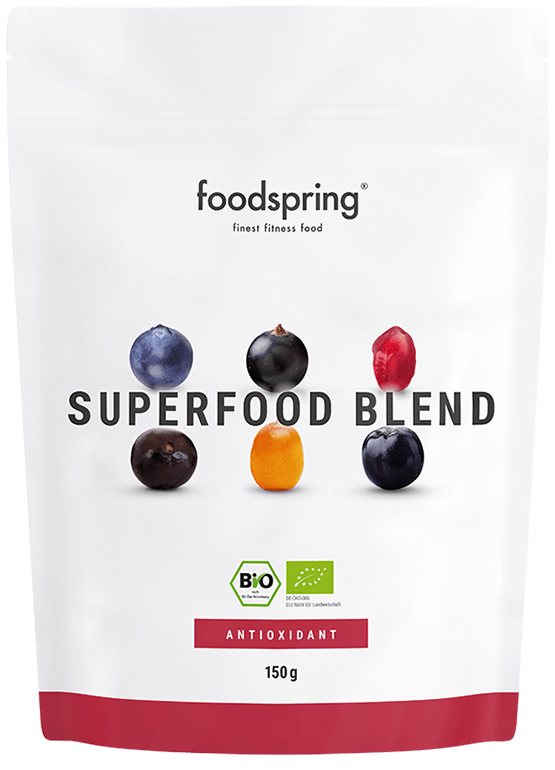 Our Superfood Blend Antioxidants contains everything that’s beneficial in berry superfoods. From seabuckthorn, acai superberries or blueberries straight from your own kitchen. Everything that's good and healthy is put together to give you a great start to the day. 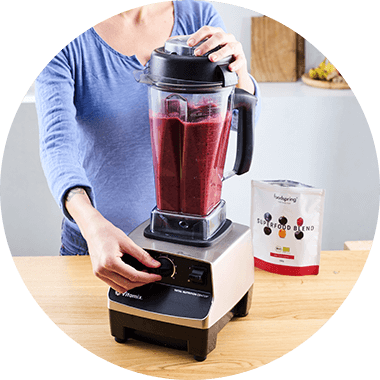 There are no limits to the advantages of Superfood Blends: Taken in the morning, you will get all the nutrients you need for a great day, and as a snack in between it is a great power booster as well. 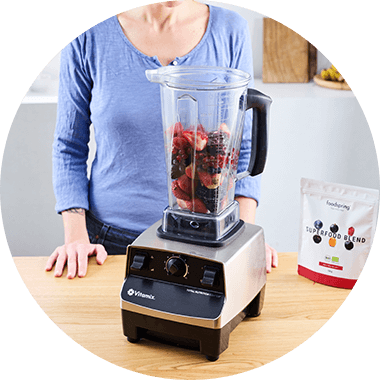 As an upgrade for your smoothie or a yoghurt topping. These are definitely worth trying! 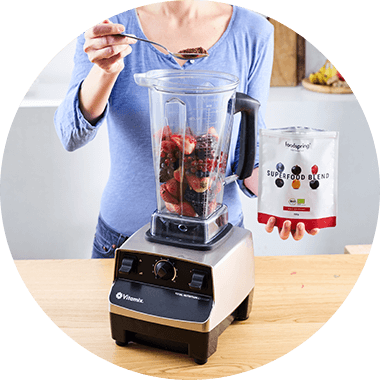 Blend of organic fruit powders for mixing into other foods. The Superfood Blend Antioxidants can be prepared in many ways. How much you use is up to you and your taste buds. We recommend using about one heaped teaspoon of the powder every day, regardless of the method of preparation. In a smoothie, in your cereal in the morning, stirred into a wholesome soup or simply dissolved in a glass of water or juice for a great nutrient boost. There is no limit to what you can do for an extra green power kick. Mix one or two teaspoons with our Whey Protein or Vegan Protein before your workout as a workout shake. The shake will ensure you get sufficient protein after exercise and can provide you with extra nutrients. This is not just great for your muscles. What makes your Mix Berries so special? 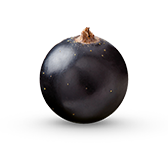 Our Superfood Blend Antioxidants stands out with its high berry content containing important vital nutrients. This makes it a natural source of essential micro and macro nutrients. You can use the powder in many different ways, from mixing it into shakes and smoothies or even into your cereal. By the way: All ingredients are vegan. Why this particular mix of berries? 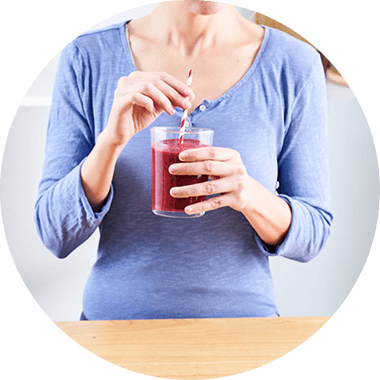 We deliver a combination of the best superfoods and the most important vital nutrients for every day in one. The mix also tastes great: deliciously fruity and sweet. What's the deal with superfoods? Superfoods are foodstuffs that have a naturally high nutrient density. This superfood mix is packed full of nutrients in their most natural form. Superfoods are reputed to have great health benefits. They contain important antioxidants and are an excellent source of protein. As the name suggests: they are simply super. How do antioxidants keep me in shape? Antioxidants are a true health miracle. They bind free radicals and help reduce stress to the body caused by oxidation. This means they support physical processes, play a role in slowing down the skin aging process and provide an extra kick of vitality in sports and daily life. 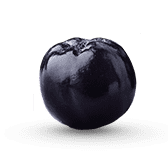 Smoothie Balls or Superfood Blends, which is best for me? 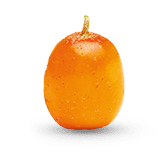 It depends what you are looking for: Our Smoothie Balls are superfoods in a small package. We do, however, only recommend these for smoothies, because they have to be broken down in a blender. 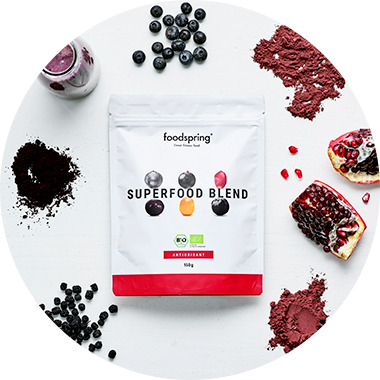 Our Superfood Blends Powder is perfect for a wide variety of other power recipes: mixed into yoghurt, sprinkled over cereal or shaken into your protein drink. Or, of course, in a smoothie, if you prefer the Superfood Blends Powder over the Smoothie Balls. Superfood Blends will be back in stock shortly.